Turtles and tortoises are reptiles. They have a special shell that acts as a shield. They are protected by a shell on top and underneath. The top domed part is called the carapace. The lower part which encloses the belly is called its plastron. Both the carapace and plastron are joined together by bony structures called bridges. The turtles’ shell is made up of 60 different bones that include part of the backbone, breastbone and ribs. This means, unlike what you see in cartoons, the turtle can’t come out of its shell. The shape of the shell tells us how the turtle lives. Most tortoises have a large dome- shaped shell as a shield against their predators. But the African Pancake tortoise has a flat flexible shell that helps it to quickly run away from their predators by hiding in the rock crevices. Most turtles that live in water have flat shells to help them to swim and dive. American Snapping turtles and Musk turtles have small, cross-shaped lower shell so they can walk more efficiently at the bottom of the ponds and streams. Different turtles have shells of different colours. The most common colours are brown, black or olive green. One of the most colourful turtles is the Eastern Painted turtle which has a yellow lower shell and a black or olive shell with red marking around the rim. Isn’t that colourful! Tortoises, which spend most of their life on land, have heavier and higher dome-shaped shells. The aquatic and soft-shelled turtles have have light shells so that they will not sink to the bottom of the sea. A lighter shell also helps them to swim faster. For example, leatherback turtles are excellent swimmers and have very light shells. Turtles were around when the dinosaurs roamed the earth. 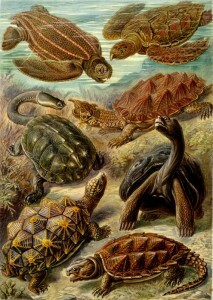 This makes turtles one of the oldest reptiles groups, compared with lizards, snakes and crocodiles. Some turtles can live to be over 100 years old. The reason why they live that long is because the turtles’ organs do keep working well as they age. Adwaita (meaning “one and only” in Sanskrit) was the name of a male Aldabra giant tortoise in the Alipore Zoological Gardens of Kolkata, India. He was amongst the oldest living animals in the world. He died when he was about 255 years old in 2006. Tu’i Malila is the second longest-lived tortoise after Adwaita. He died in 1965 at the age of 188. Next, Harriet, a Galápagos tortoise is the third longest-living tortoise who died at the age of 175 years old in Australia in 2006. Some of the many species alive today are in danger of dying out. All the sea turtles are endangered. There are laws to protect them, but their meat is highly in demand in some cultures. Turtles soup is an expensive dish, for example. They have been so aggressively hunted in Asia to the extent that the turtles have almost completely disappeared. Guess what ladies! Fat from turtles is also used in the Caribbean and in Mexico as an ingredient in cosmetics. A turtle’s bottom shell is used in traditional Chinese medicine. To meet the high demand for turtles many people have started to set up turtles farms in China, Oklahoma and Louisiana. Turtles are cold blooded. Therefore their bodies change temperature according to their surroundings. The turtles remain lifeless in the cold water. Most of them sleep during winter. All turtles and tortoises breathe air. Turtles underwater have to go to the surface to refill their lungs. Turtles do not lay their eggs underwater. Most of the female turtles return to the beach to lay their eggs after travelling hundreds of kilometres. Turtles have flippers to help them to swim . Believe it or not they can swim as fast as humans can run on the land. They move their front flippers to swim and the rear flippers do the steering. Since they are so used to be in the water, they find it really hard to move on the ground. That is why mother turtles move very very slowly on the land, dragging themselves forwards with their flippers to find a place to dig a hole and lay their eggs. They will lay several hundred eggs which will look like ping pong balls. They will cover the hole with mud or sand. The mothers then leave their eggs in the hole. Mother turtles do not care for their babies. The heat from the sun will help to hatch the eggs. Female turtles hatch from the warmer eggs which are nearer to the surface of the sand or mud. Male turtles hatch from the cooler eggs which are at the bottom of the hole. These tiny baby turtles dig to the surface themselves and then swim to the sea. There are many birds, crabs and animals waiting to feast on them as they make their way back to the sea. Sadly, only 1 % of all the baby turtles reach adulthood. Some turtles can lower their neck and pull their head straight back into the shell. These species of turtles include freshwater turtles, snapping turtles, tortoises, soft- shelled turtles and sea turtles. Other turtles, called side-necked turtles, pull the neck sideways into the shell. They are called side-neck turtles, and live in the southern hemisphere. A turtle’s head is covered in hard scales. Most turtles that spend most of their time on the land have their eyes looking down at objects in front of them. Some aquatic turtles like snapping turtles and soft-shelled turtles have eyes closer to the top of the head. These species of turtles can hide from predators by sinking down in shallow water, but making sure that their eyes and nostrils are above the surface. Sea turtles have glands near their eyes to get rid of the excess salt in their body they get from their drinking water. Turtles have superb night vision. It helps them greatly to see clearly at the bottom of the dark ocean or at night on the land when they come out to lay their eggs. Some turtles eat both plants and meat, some eat mostly plants and others mostly meat. Turtles do not have teeth but they have a strong beak. Plant-eating turtles have a saw-like edge to their beak which helps them cut into tough food like sea grasses. On the other hand, meat eating turtles have knife-sharp beak for slicing through their prey. Turtles use their tongues to help them to swallow their food but they cannot stick out their tongues to catch food like a frog. The largest living sea turtle is the great leatherback sea turtle. The length of its shell is about 200cm (6.6 feet) and can weigh over 900 kilograms (2000lb). Its shell is covered with leathery skin with raised stripes. It has a higher body temperature than the surrounding water because of its high metabolic rate. It lives in the warmer ocean oceans. Sea turtles have more flatter shape so they can glide through the water gracefully. They live in the sea all their lives. Archelon (meaning ruler in Greek) turtle is the largest sea turtle ever, but it is already extinct. It was 4.6 metres (15 feet) long. It was more than 2,200 kilograms (4500lbs). Most of the remains of Archelon turtles could be found in South Dakota and Wyoming. There are some turtles which also live in fresh water. Fresh water turtles are generally smaller compared with the sea turtles. The largest fresh water turtles are the Asian soft-shelled turtle. This turtle can grow up to 2 metres (6.6 feet). Turtles eats both plants and insects. They have webbed front feet which look like flippers. Pig-Nosed turtles have real flippers. But tortoises, which spend most of their life on the land, have stumpy legs with sharp claws for digging. Tortoises only eat plants and leaves and other low lying vegetation. They tend to stay in one area. They only enter into the water when they are thirsty or bathing. They can be drown in strong currents. They can be found in dry areas. They are typically larger, bulkier and heavier. The largest living tortoise is the Galápagos tortoise which grows to about 1.8 meter (6 meter) long and it can weigh over 400kilograms (882lb) . It is among the longest lived of all vertebrates. It can live over 100 years old in the wild. The oldest Galápagos tortoise was at least 170 years old. It is found on the Galápagos Islands in the Pacific Ocean. The largest extinct tortoise is the Meiolania tortoise. They are found in North and South America, Australia and Africa. They became extinct 2000 years ago when man started to hunt them for food. They are about 2.5 meter(8.2 feet) long. On the other hand, the world’s smallest tortoise is the speckled Padloper tortoise – the males only grow to about 6-8 centimetres (2.4- 3.1 inches) long – but the females are somewhat bigger. They weigh about 95-165 gram (3.4-5.8oz). Their favourite food is small fat plants with lots of water in them. They live on rocky ground. They can be found in western South Africa. Two other small species turtles are the American Mud turtles and Musk turtles that live in an area that ranges from Canada to South America. Their shells were less than 13 centimetres (5.1inches) in length. Turtles use the help of sun’s rays to warm themselves and they use water or shade to cool themselves. The tortoises tend to warm their bodies by sun bathing and also burrowing themselves under the ground to keep cool. The outer layer of the shell is part of the skin. Turtles do not shed their skins all at once like the snake. Turtles shed their skin bit by bit. Tortoises also shed skin. These dead skin will accumulate into a thick knobs and plates that will protect certain parts of the body outside of the shell. Big turtles tend to swim less than the smaller ones. For example, the Alligator Snapping Turtle, which is one of the largest freshwater turtles in the world, hardly swims at all. They prefer to walk along the bottom of the river or lake. Turtles use their long claws to climb onto riverbanks and floating logs. Small land turtles and freshwater turtles are sometimes kept as pets. The most popular ones are Russian Tortoises, Spur-Thighed Tortoises and Red-Eared Sliders.